The vertical drop from summit to base is 1001 ft. The average difference in altitude between base and summit of Ski Resorts in Italy is 3087 ft. Runs and slopes are therefore relatively short. The highest point of the track is 5938 ft above sea level. 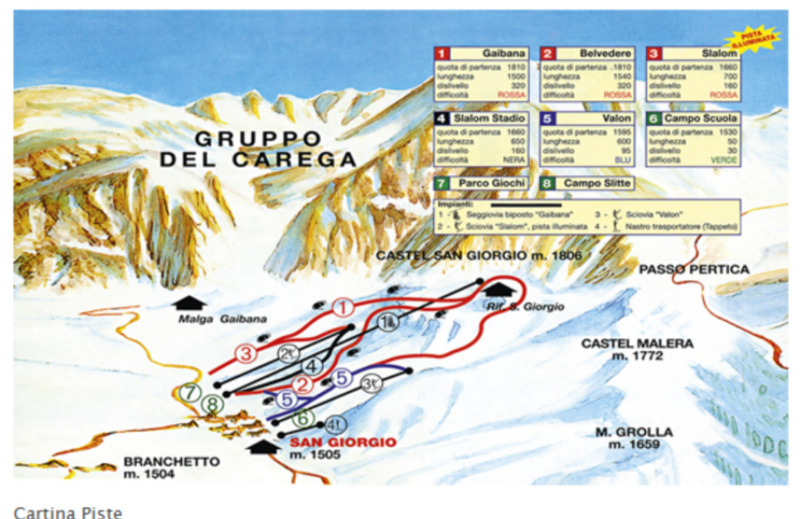 The day pass at Malga San Giorgio is €25 making it one of the 3 cheapest ski Resorts in Veneto. Malga San Giorgio makes any skiers wishes come true, even though it is one of the smaller resorts of the region. Next to the approximately 5km of slopes you will find that this resort offers all the amenities that make you enjoy Italy so much. You can either eat in the cozy atmosphere of the small chalets or relax in the sun on the different terraces. The food is a culinary highlight in the tradition of Italian food. Even cross-country skiers will adore Malga San Giorgio, as it features beautiful slopes full of powder and fun.